St Margaret is one of the highest churches in Suffolk - geographically speaking, not ecclesiastically. There are two approaches to the village, either up the long, winding, steep lane from Hartest, or another long, winding, steep lane from the Hawkedon road. This second approach, in particular, is very unlike any other part of Suffolk. Looking back at the broad hills and torrent of the river, I was put in mind of the North. 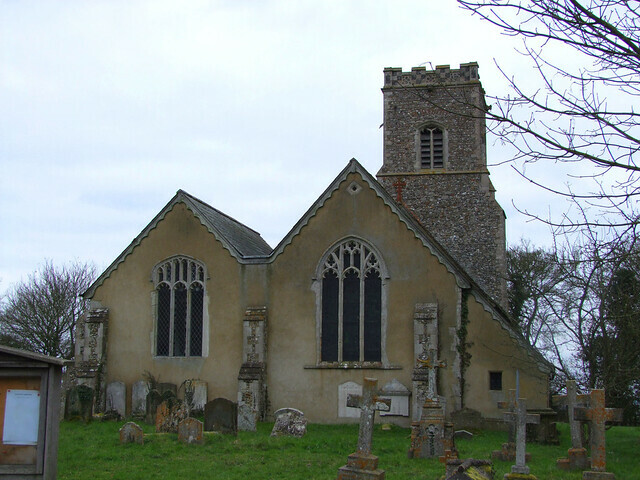 St Margaret is one of a sequence of hill top churches in a line from Denston in the west to Boxted in the east, which perhaps suggests something about the former pagan uses of the church sites. This was a thrilling thought, but the bungalows and cottages soon restored a sense of the familiar. The village is known as Upper Somerton, presumably to distinguish it from the cluster of houses around Somerton Hall at the bottom of the hill. The keyholder, listed on the church sign, can be found at a nearby cottage, although it is hard to see the point of keeping the church locked here. As you approach the church from the east up the churchyard path, you will be forgiven for thinking that here is a major Victorian reconstruction, with a new nave put alongside the old one, turning it into a north aisle, as at St Mary at Stoke, Ipswich. But nothing could be further from the truth. As you continue up the path to the south of the church it becomes clear that this church has what appears to be a second, southern, chancel beside the first. It is a chancel chapel of course, but it is so unfamiliar in Suffolk small churches that one needs to take it in. A quick tour of the outside will show you a blocked Norman north door in the nave, and the internal arcades are late 13th century. This is an old church. There seems to be the remains of the base of an arch in the extreme south-east corner of the nave. Was a south aisle planned and never built? It would have made sense. Stepping through into the chancel (there is no arch), you see the south chapel and its juxtaposition with the chancel. Mortlock notes the 13th century shafts of earlier windows either side of both east windows, so this chapel, too, is very old. Between them, there is a curious squint with a piscina drain inside it - presumably to serve both altars, although there is another piscina in the main chancel just to the left of it, within an arched opening. Something similar to this arrangement of a chapel beside the chancel exists nearby at Boxted, where the Poley family built an outrageously magnificent north chapel in the eighteenth century. Its position was probably inspired by this one. All three lads remembered on Somerton's pretty little war memorial were killed in a three month period towards the end of the War. None of their bodies were ever found. They are Harry Honeyball, Jesse Stiff and Frank Simpson. Harry Honeyball, who gets a separate brass memorial to himself up in the chancel, was the son of William and Lydia Honeyball, and the husband of Emily Honeyball. He lived at Mile End Farm, Hartest. A private in the 8th battalion of the Border Regiment, he was killed near Ypres on 6th September 1917. He was 32 years old. Harry's body was never recovered, and he is remembered on the Tyne Cot Memorial to the Missing on the former Ypres battlefield. Jesse Stiff was the son of Alfred Stiff, of Upper Street, Somerton. A private in the 1/5th battalion of the Suffolk Regiment, he was killed in Palestine on the 15th December 1917. He was 29 years old. He is remembered on the Jerusalem Memorial to the Missing. Frank Simpson was a private in the 7th battalion of the Suffolk Regiment. He was killed in the Battle of Cambrai on 30th November 1917. He is remembered on the Cambrai Memorial to the Missing at Louveral on the Somme. That this parish lost just three of its boys is a mark of how tiny it is.